This Scripture was meaningful on several levels. First, Jesus speaks about worshipping the Father in the Spirit, which is the gift the Church received at Pentecost, whose anniversary we were commemorating. Second, he explains that true worship in the Spirit is no longer attached to a specific place, whether it be Samaria or Judea. 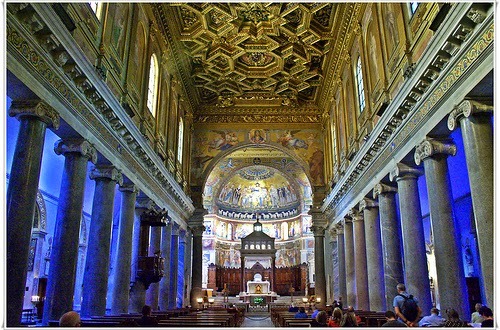 How fitting then, that not only was God being worshipped at St. Peter’s—Rome’s functional equivalent of the “mountain of Jerusalem”—but also in a small room a few blocks away, together with Christians all around the world, far from any mountain. Third, Jesus says that salvation is from the Jews. In the reading from the Acts of the Apostles on Pentecost, there is a list of places from which Jewish pilgrims have come to observe the great feast. One of those places was Rome. In his homily, Fr. Michael explained that those pilgrims would have lived in Trastevere, a neighbourhood not too far from the Vatican. In other words, some of the Roman Jews present at Pentecost who heard Peter and the apostles preaching would have returned home to this very neighbourhood and begun a Christian community. Here in Rome, salvation came directly from the Jews. After luncheon with Fr. Michael in his community, I walked down along the Tiber to visit the Basilica of Our Lady in Trastevere. In a sense, it is the parish of the first Roman Christians, even if the actual building—which is one of the oldest in Rome—does not quite date to that primitive community. The basilica was cool and not too crowded, and I remained there for half an hour or so. Jesus taught that true worship is in Spirit and truth, but he did not say that concrete places are of absolutely no importance: of course they are. In that very church the Father has been worshipped in Spirit and truth for nearly 1800 years, and it is awesome to be in a place where that is the case. But the same Spirit blows where he will, and cannot be contained even by a venerable basilica in the first Christian neighbourhood of Rome. For if we arrive as pilgrims, it is only so that we can be blown out again, rejuvenated in the Spirit. I dunno what's up, but that link at the end sends me to the Staples website. Perhaps this is a deeply spiritual message beyond my ken? Well, the Spirit does blow where he will, but not sure if He meant to blow you all the way to the Staples website! There was a typo in the hyperlink: eway instead of biblegateway which I've just fixed. The centralization of Rome has been one of the biggest problems in articulating a broad Catholicity suggested by the text quoted above regarding worshipping in Spirit and truth. Pope Francis is doing a good job articulating his role as Bishop of Rome. But given how Rome has centralized authority for translations, ordination practices (e.g. ordaining married men requires permission from Rome not the local Church's bishop), the dismantling of Bishops conference as consensus builders for local practice, it is hard to see how the modern Church is living out the New Testament gospel in its ecclesiology. Sorry for not responding to this comment earlier—I've been travelling recently! What exactly is meant by "broad" here? That is, in what sense is it necessary to qualify the word "catholic", which already carries the meaning of universality? Further, Jesus is just as concerned with right worship in the quote as he is with the catholicity of worshippers. There's more going on here than a call to worship in many geographical places. So I'm not sure if the issue of the structure of Church government fully addresses this gospel passage.